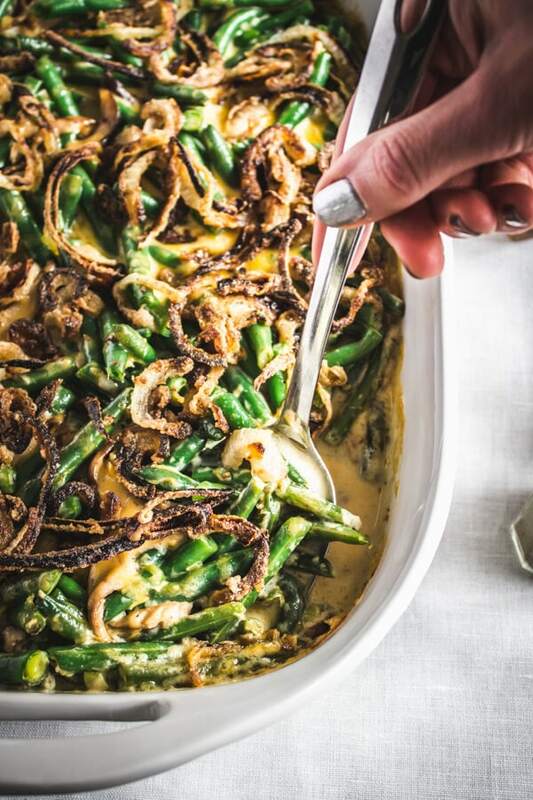 Cheesy Green Bean Casserole. Is Thanksgiving even Thanksgiving without green beans baked in some kind of creamy soup and topped with crispy fried onions?! Nope. It’s a Thanksgiving side dish staple. 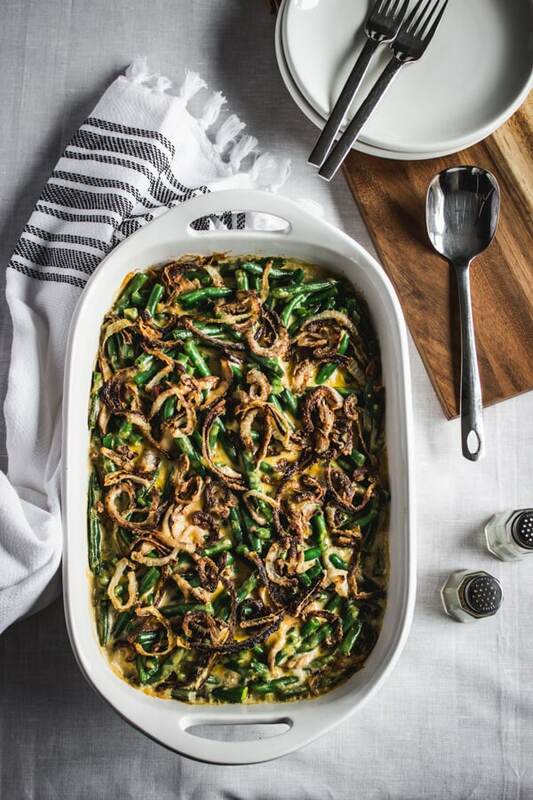 Each of us swear by our own version of green bean casserole. With mushrooms or without? Add bacon or ham (or neither)? Canned green beans or fresh? Canned condensed soup or homemade? Canned fried onions or homemade? Cheese (is this even a question)? I’m on Team Mushroom Bacon Fresh Homemade Homemade. And definitely Cheese. But you do you. 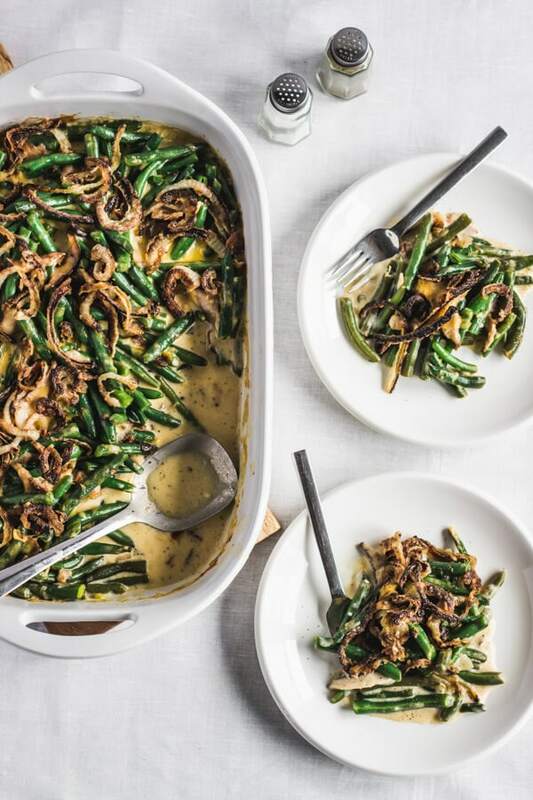 There’s nostalgia in green bean casserole. Memories of being a kid with holiday visits to great-grandma’s house filled with all the amazing smells. Thanksgiving at our family gatherings always included a turkey (and sometimes a ham as well), mashed potatoes, super soft dinner rolls, some kind of Jell-O something, enough pies and desserts to feed a small town, and cheesy green bean casserole (two helpings please). At least that’s what I remember. As a kid, holiday meals at my great-grandparents house felt magical. Probably because I would manage to eat more dessert in that single day than the whole year combined. Most of those Thanksgiving dishes have continued into my adulthood (with the exception of the Jell-O something). And they have also evolved. Like the cheesy green bean casserole. My family joined the ranks of thousands of homes across America who embraced the recipe created in 1955 by Dorcas Reilly who was one of the first full-time members of the Home Economics Department for Campbell’s. Based on a recipe request from the Associated Press, Reilly took ingredients that were common staples in the 1950s like canned green beans, French fried onions, and canned cream of mushroom soup and produced what was first known as the “Green Bean Bake” publishing her recipe on the back of Campbell’s Cream of Mushroom Soup cans. And those ingredients are exactly what my family used in order to make our holiday green bean casserole until the year when I realized gluten was not my friend. 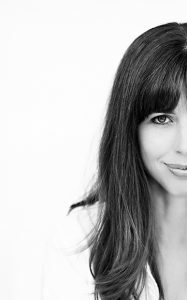 And sometimes it takes a disappointment, like realizing your Thanksgiving meal might be void of cheesy green bean casserole, to discover that you can take a cherished recipe and turn it into something that is even more tasty and can be enjoyed by those both gluten intolerant and those who are not. 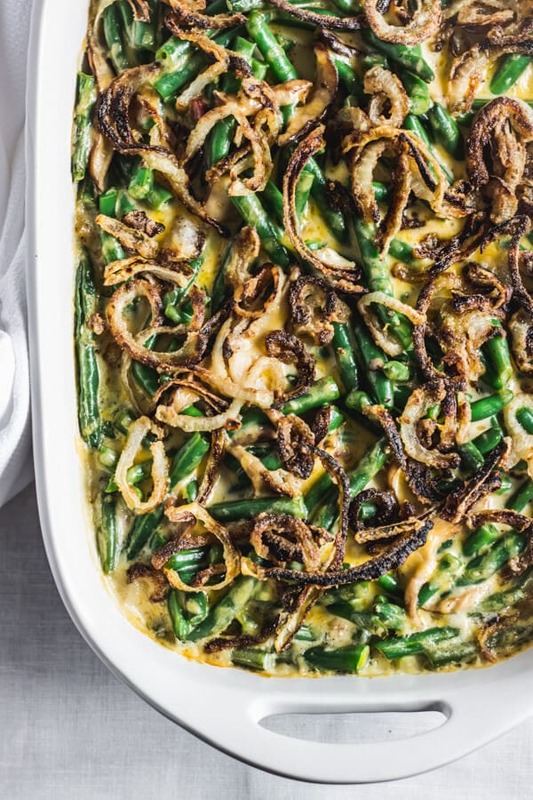 Cue the new and improved Gluten Free Cheesy Green Bean Casserole. Canned French fried onions are now homemade. 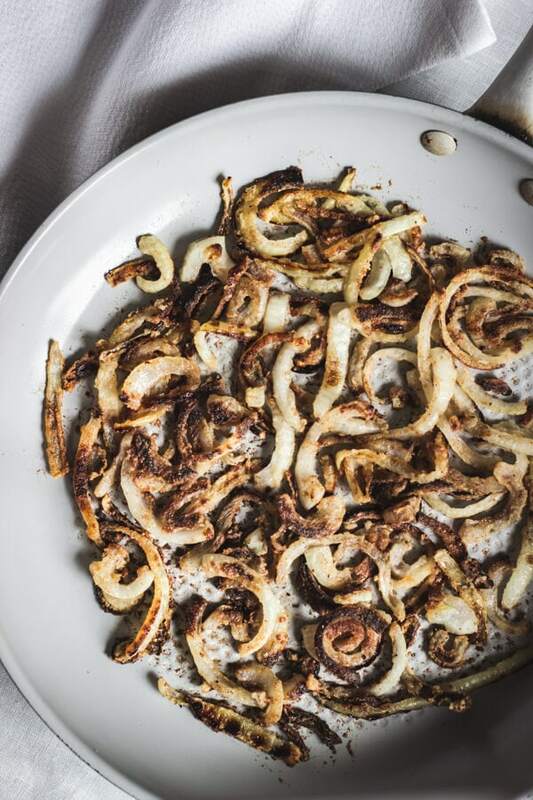 Thinly sliced sweet onions are tossed in a little bit of gluten free all-purpose flour and then sautéed in a little butter until they reach a lovely browned crispiness. You could also dredge your onions in milk or buttermilk first and then dip them in the flour to get a thicker crust on the onions but I don’t. I’m happy with cutting out the extra step. Since onions have moisture in them already the flour sticks to the onions and provides just enough coating to give me the type of crispiness that makes me happy. Just try not to eat them all before you’ve topped your cheesy green bean casserole. Where are my fellow Team Bacon members?! Hiiiii! 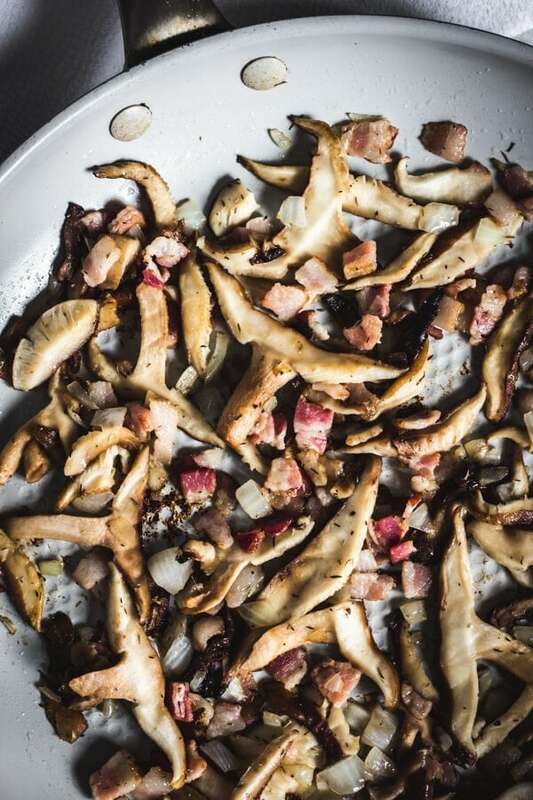 Chop several slices of bacon and cook until the bacon has rendered sautéing with finely chopped onion, thyme, and rich, earthy shiitake mushrooms. Yummm. 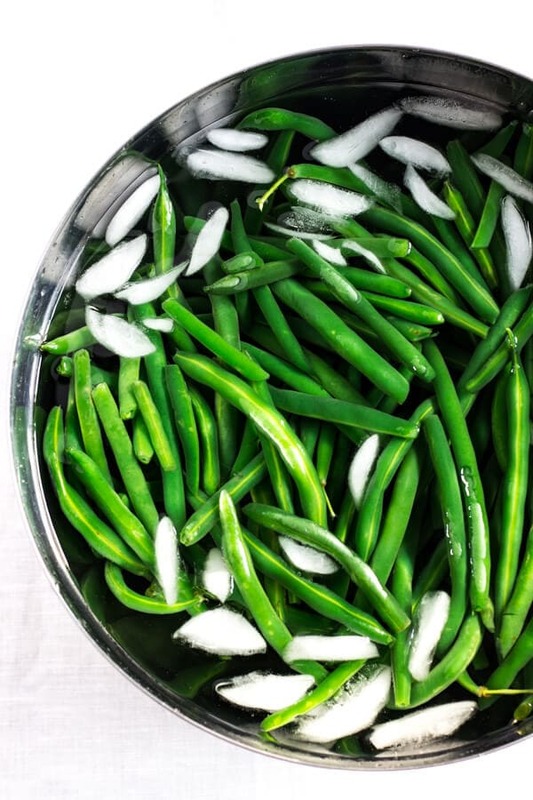 Canned green beans are replaced with fresh green beans because…fresh. But there is no judgment if you want to stick to your tried and true canned green beans. Remember, you do you. But also be okay with stepping out of your comfort zone this year and trying fresh. Just pop them in a pot of boiling water for 3-5 minutes depending on how crispy you like your beans and then transfer them to an ice bath to stop them from cooking further. You’ll have beautiful, bright, tender, crisp green beans as a result. What’s not to love about that. We’re also omitting canned cream of mushroom soup and making our own. 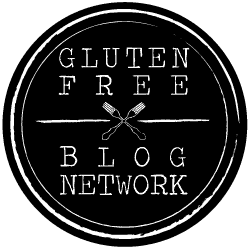 Sorry Campbell’s, your soup is not gluten free friendly. And gluten free versions of processed, store bought cream of mushroom soup have not been up to par on the tasty scale in my opinion, either due to lack of flavor, weird flavor, or just too salty. 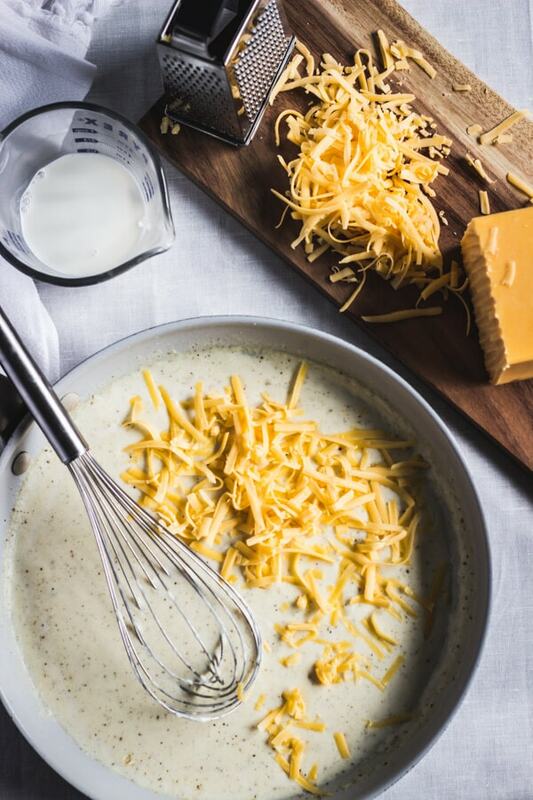 So we’re taking the creamy soup base into our own hands, which doesn’t take a whole lot of effort and gives us a creamy, cheesy sauce that you may just want to dunk your whole face in. Go ahead. I won’t tell. Combine the bacon mushroom mixture with the cheesy sauce. 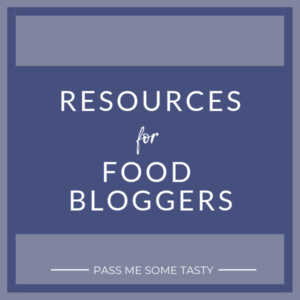 Add your fresh green beans. Top with a little more shredded cheese simply because you can, and finish off your casserole with the crispy onions. Bake for 25 minutes and done. Thanksgiving dinner can now be served. And all the people around the table cheered because cheesy green bean casserole lives on. Cheesy green bean casserole made from scratch! Fresh green beans in a homemade creamy cheesy sauce with shiitake mushrooms and bacon and then topped with homemade crispy sautéed onions. 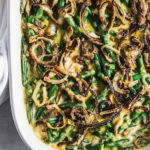 Finally a cheesy green bean casserole that is both gluten free and incredibly tasty! In large pot, bring lightly salted water to boil. Add green beans to boiling water and cook for 3-5 minutes depending on how crisp you prefer your beans. Remove beans from the boiling water with a slotted spoon and immediately plunge them into a large bowl of ice cold water to stop the cooking process. Drain beans once they’re cool and set aside. Toss thinly sliced onions in gluten free flour. Season with salt and pepper. Place floured onions in skillet making sure they are spread out and not crowding each other (save the leftover seasoned flour, you can use it for the creamy mushroom cheese sauce). You may have to cook the onions in two batches if you’re skillet isn’t large enough in order to prevent overcrowding. Allow the onions to cook for about 5 minutes without flipping or scooting them around your skillet. This will give them the opportunity to get crispy and brown on one side. Then flip the onions and cook for about another 5 minutes or until they are browned and crispy to your liking. Remove onions from the skillet and set aside. Placed chopped bacon in a large skillet over medium heat. Allow the bacon to render (about 3-4 minutes). Once bacon has rendered, add mushrooms, onion, and thyme. Sauté for about 5 minutes. Remove mushroom mixture from skillet and set aside. Melt butter in the same large skillet you used for your mushroom mixture over medium heat. Add the garlic and sauté for 1-2 minutes, stirring occasionally, until fragrant. Add in gluten free flour and continue to stir and sauté for 1 more minute. Then using a whisk, gradually add chicken broth and the half and half, whisking until the flour is evenly dissolved. Add grated sharp cheddar cheese, and stir to combine. Continue cooking the sauce until it reaches a simmer and thickens. Then remove from heat. Add the mushroom mixture to the creamy, cheesy sauce and stir to combine. Season with salt and pepper to taste. 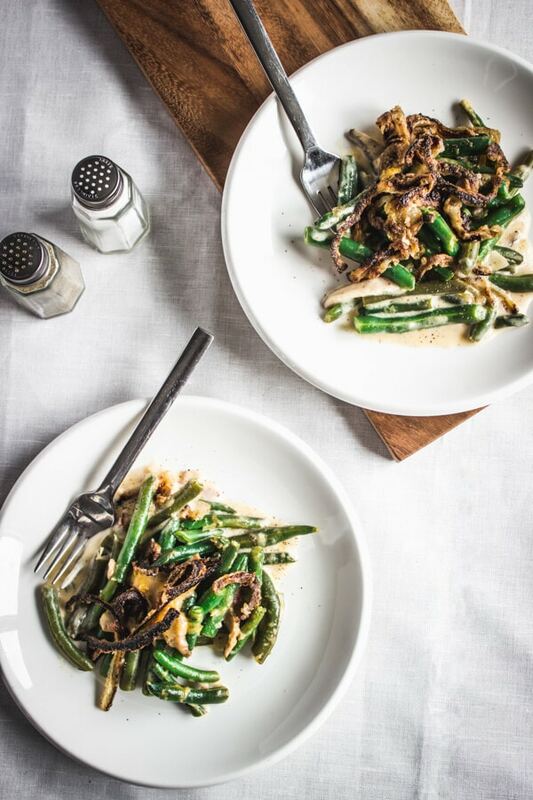 Combine the green beans and the creamy mushroom cheese sauce in a large bowl and stir until evenly combined. Transfer to a 9×13-inch baking dish and spread the green bean mixture out in an even layer. Sprinkle evenly with extra grated cheese and the crispy onions. Bake for 25 minutes or until sauce is bubbly. Check on the casserole when it’s baked for about 15 minutes. If the onions look like they are beginning to char or brown too much for your liking, simply lay a piece of aluminum foil on top of the casserole and continue to bake. What are you waiting for?! Dig in! 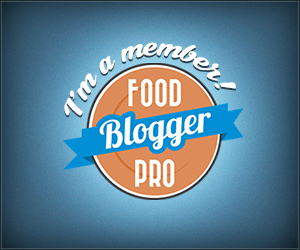 Be sure to also check out these other recipes for your holiday meal festivities!